Gary Peterson, Playwright and Co-Founder of FindJodi.com, Inc.
Join FindJodi.com, Inc. 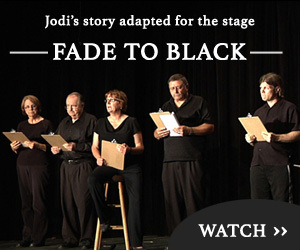 Co-Founder Gary Peterson, Director of the Brave Community Theater of Spring Valley Debi Neville and the entire cast as they perform ‘Fade to Black’ – the story of the Jodi Huisentruit disappearance. Jodi Huisentruit disappeared on June 27, 1995 from her apartment complex parking lot. She was on her way to work and was never heard from or seen again. There are no suspects in her case. ‘Fade to Black’ is about Jodi’s last days before her disappearance. The story is told through intimate excerpts of her journal, letters to and from friends and stories told by Jodi’s family and friends. The original play will be performed for four nights beginning June 27, 2012 at the Spring Valley Community Center in Spring Valley, Minnesota. You may purchase advance tickets below. * In cooperation with the Southeastern Minnesota Arts Council Inc. through funding from the Minnesota State Legislature.